Bar/Bat Mitzvah & Sweet 16 Entertainment that you, your family and your friends enjoy from start to finish is our goal and your assurance with NYU Entertainment. NYU Entertainment prides itself as being one of the most trustworthy and knowledgeable companies in the industry. That said, we also engage the most reliable and quality vendors in the metro area to make your occasion spectacular. Why not have your special day planned through one central agency, NYU Entertainment, eliminating the headaches that come with dealing with several different vendors at once? Our party specialists will assist you with the entire planning of your event, from soup to nuts, including: Venue selection, Caterer, Photography, Invitations, Limousine Services and a thousand other details. The entire MC/DJ entertainment industry was created by only a handful of truly gifted entertainers, two of whom started NYU entertainment. 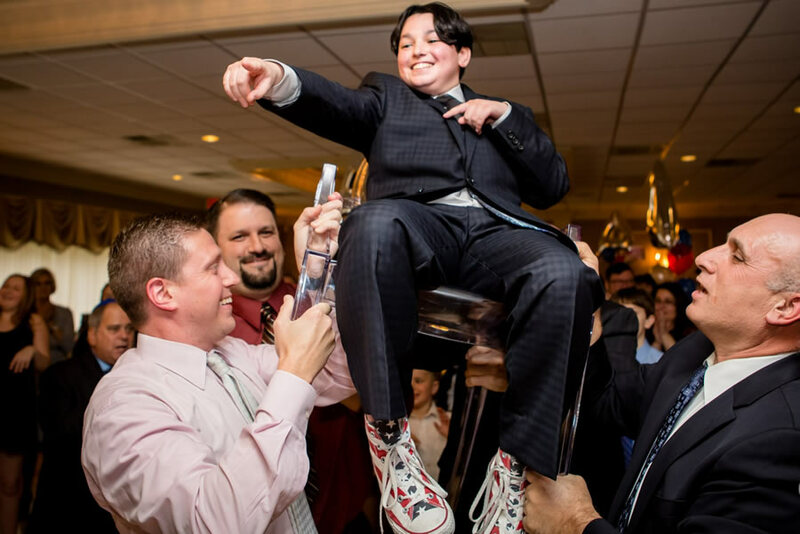 Through selective training, and intense tutelage, we have built a stable of charismatic, polished and extremely talented MC’s – All with the experience hundreds of bar mitzvahs under their belts. Our MC’s have made us who we are: not the biggest, not the most expensive, simply the best. The DJ is the backbone to an entertainment group. As the MC is often asked to do less motivating at today’s high-end mitzvahs, the DJ must do more. • LOOK GOOD DOING IT! Our tasteful party motivators will add vibrant energy to the party without deflecting any of the focus from you or your guests. They’re the perfect complement for any dance floor and will help you rock the night away! Whether you’re following along in a group or being dazzled by our skilled break-dancers, you’re guaranteed to be pleased. Our team consists only of bright, energetic, attractive and engaging performers! NYU Entertainment employs several full-time performance bands. All of our orchestras are cohesive groups who have been performing events together for many years. This is not your typical bar band or a cheesy cocktail lounge act; this is music you know and love, performed with energy, style and sophistication by dedicated artists! Our bands give you the best of both worlds; the energy of live talented singers and musicians interacting with your guests. Do you love DJ’s? Well, so do we. But perhaps you want some live musicians to play along with the DJ. If so, we have them. This may sound like a new concept, but we have been combing percussionists, saxophones, live vocalists and more with our DJ packages for over 10 years. It’s a craft we’ve perfected. A full band and disc jockey working together, seamlessly transitioning from one medium to the other: It is truly the best of both worlds… and more affordable than you might think. An MC and DJ accompanied by 1 to 4 live musicians–NYU digitally removes instruments from certain recordings so that they can be played live by our musicians along with the DJ, creating a smooth synergy of live and recorded music. NYU Entertainment employs a team of talented videographers who will document and create a video that you will treasure for a lifetime. Our video crews are specifically trained to capture every moment while not interfering with the flow of the party. One of the benefits of having your video produced by your entertainment company is that our videographers work with our MC’s and bandleaders on a weekly basis thus making your video a truly collaborative effort between entertainer and shooter. NYU Entertainment has a large inventory of plasma screens and 8-25 foot video screens. These screens will never be empty, and they’ll be filled with the wonderful visuals that your guests provide. Our video projection setups are manned and operated by experienced, specifically trained technicians. Our video screens are an important part of any DJ package, and it’s something so magical, you have to see to believe. The NYU Video Production department is truly unique. Yes, we shoot your entire party then edit it to a beautiful finished product for your family to cherish for years to come, but there is so much more. … if you can imagine it, we can provide it!